Roland Barthes once wrote about the death of the author. At the time of the essay, authors were considered to be very powerful in terms of being able to dictate the kinds of readings and interpretations that inspire artistic influences, and were considered to be original and groundbreaking in their own ways. There’s not much wrong with that, you might think, but Barthes argued that the power shouldn’t and doesn’t really lie with the authors. The interpretation of a text, its meaning and subtle differences, lies not in the writing hands of the authors, but in the audience of a particular text. He was writing primarily about novelists, but film can also be considered as a form of text. Hence, the author is dead, because, while he is able to dictate the terms of interpretations (limiting it to what is within the text itself), the power of reading, and the making of meaning, is up to the audience. We can use some of that theory here in ‘Written By’, a very smartly written Hong Kong film that deals a lot with the issue of death. The iPad is so wonderful, it even made the blind see! It doesn’t just deal with the issue of death, we are hit with it right from the off. 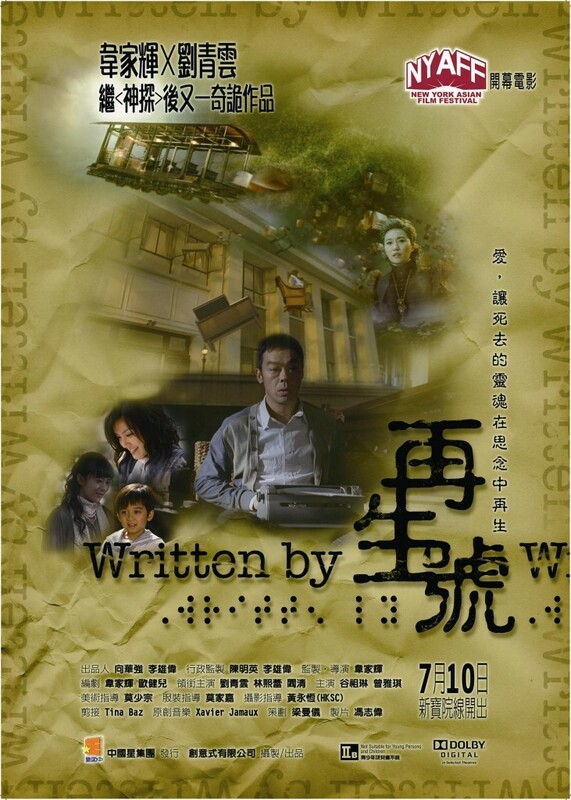 A family is involved in a car accident, in which killed the father, Tony (Lau Ching-Wan). 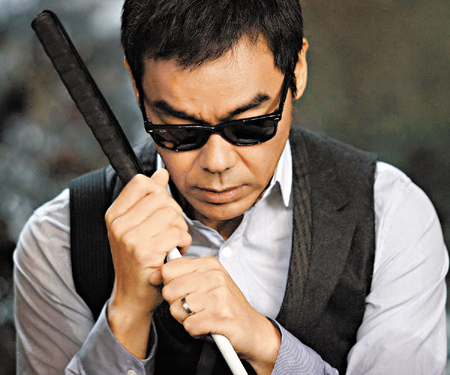 He leaves behind his wife Mandy (Kelly Lin), his son Oscar (Chung Ying-kit), and his daughter Melody (Mia Yam), who became blind as a result of the accident. Predictably, they have a hard time dealing with such an incident, and despite the years that went by, they still grieve about his loss. Mandy even took multiple PhDs to fill the time, while Melody, despite her disability, became a literature student. One day, she has an inspired idea. “Mom,” she told her mother tearfully, “I want to write a novel about us, about our family. I want Dad to live again, and he can live on in this novel.” And so her novel became a complete opposite of what reality is like for them; instead of the father dying, he is alive, but is blinded (as what happened with Melody). Instead of his family living on and grieving, they perish in the accident. So begin a mind-bending, multiple-reality-disorder of a story that as satisfying at the end as it is complex to make, shoot, and, for the audiences, to understand. For that is the key point here: the audience. Following on from Barthes, the author may be dead, and the power may lie with the audience, but he still has the power to create life within his own story. As Melody herself described in her voiceover, “In the novel, things happen as I wish. I write my novel and decide life and death.” It reminds me of an excellent Japanese film I saw a few semesters back, titled ‘Throw Away Your Books, Lets Go Out into the Streets’. Apart from being one of the more oddly titled films I’ve come across, the film deals with some very interesting issues. In the film, near the end, the protagonist stopped, and all the supporting cast members came back into the frame as he starts to address the audience: “When you finish watching this film, when the final frames roll, these people will cease to exist. But the stories told here, their histories are true? What will happen to them? Will they be forgotten? Will you remember them?” That isn’t an exact quote, before you start to jump on my back, but the main essence of it remains. It is not an isolated phenomenon either, for we do get attached to our favourite characters of our favourite TV shows. News of its cancellation is not one that is greeted kindly, no matter how crap it has become or how low the ratings were. The graduation ceremony for UiTM was sombre this year. However, what if the person writing the book, making the film, is writing about someone who is writing another book, making another film within that particular reality itself? For this is what we have here: in Melody’s novel, as she is writing of her father, we promptly switch our perspective into the reality that she is creating. And in that reality, her father is living alone, aided by a Philippine maid Maria (Yeung Shuk-man). And instead of Melody writing the novel, the father is writing a novel about his own family as well, wondering what would have happened if he had died. So what we have here are three different realities: one that is considered to be the real one, another an alternate version of it, and an alternate version of the alternate version. Confused? You should be, because the film switches back and forth between these realities with almost reckless abandon it is…beautiful. Beautiful, because the whole film challenges us not just stylistically, but also substantially. It asks some very interesting questions that you and I may not necessarily want to consider. For, if the father’s world is written by Melody, then who is writing the real world? “Maria,” Tony asks her maid, as he mourns for his family at the graveyard, “Who decides who will die?” Maria couldn’t quite answer, however, as the night grows darker at the creepy graveyard: “I don’t know, sir! I’m scared!” This question pops up again near the end of the film, when Melody thinks about committing suicide. She gets up on the ledge, stands there, turns around to look at us, and asks, “But who’s writing the story in the real world? Who decides life and death?” She is blind, and as is the common interpretation for a lot of blind characters in fiction films, her eyes are wide open, unblinking. She might be talking to herself, or it may be an attempt to address a higher being, but she is looking at us, directly through us, members of the audience. She is breaking the fourth wall that Godard himself lovingly do with reckless abandon (“Who’s that looking at us?” “Oh, that’s the audience.”), and is directly asking us to consider the bigger question not just within the film, but also without. The title also implies this; ‘Written By’ is usually followed by the name of the actual author, but in this case, it is left somewhat hanging, the author not truly identified as yet. For the new ads, Ray-Ban changed their target market. Make no mistake, however; this film is not a deliberate attempt to gain higher artistic ground. Perhaps there are some elements of it that the director and screenwriter, Wai Ka-Fai, have deliberately inserted, but within the film, it is part of an even bigger question: why me? The film is essentially about grieving for the loss of loved ones, about the difficulty of overcoming such an immediate and empty void in one’s life. The writing, lest we forget, came as an attempt to deal with the loss, and it is the loss that precipitated the writing. As tragedy strikes both Melody and Tony in their respective worlds once again, they turn even more to their writing, unleashing all of their anger, bitterness, frustration and debilitating situations into their respective novels: “Why me? Why my family? What did I do wrong?” It is this attempt to question, to challenge death, that brings about unintended consequences for the both of them, as not only do their worlds collide, but Meng Por (Jo Kuk), the Chinese God of Death (apparently) comes into play, and she’s not particularly happy that they’ve decided to ‘resurrect’ people in their novels. Reading back over what I wrote, I realise that perhaps the picture I’m painting of ‘Written By’ is not particularly a happy one. Yes, it deals with death, and the dealing of death, and you are able to go in several different directions and layers in interpreting the movie. However, I hasten to add that it is also a rather positive film at times. The lighting used by the cinematographer, Wong Wing-Hung, is bright and cheerful for the most part. Some parts are also downright hilarious; when Mandy brings her husband home after he is injured, everyone gathered around her to see whether she is a ghost, or a human being. They all flee when they realised she’s not real: “Ghost!” I laughed out loud at that part, that’ll teach them to be so busybody. 🙂 It is also, dare I say it, a fantasy film. Not just of the kind of Melody or Tony’s fantasy of everyone not really dying, but of the flying sofas, dogs that changes into humans, and trains that carries ghosts into the other world kind of fantasy. A fantasy-comedy-drama that plays itself out within three different realities that clash with each other. For once, Roland Barthes might just be wrong about the author.